Sumud Palestine is sponsoring a new training course on Schema Therapy organised jointly by Sumud Palestine and the Palestinian Association for Behavioural and Cognitive Therapies (PABCT) for Palestinian mental health professionals who have attended previous courses sponsored by Sumud Palestine. Schema therapy is an advanced type of psychotherapy that has a proven record of helping people with enduring and chronic mental health problems. Dr Christoph Fuhrhans will deliver the training at Al Quds University in Abu Dis. Dr Fuhrhans is highly specialist psychiatrist, founder and leader of the Institute for Scheme Therapy Eastern Switzerland (ISTOS, www.istos.ch) and the former president of the Scheme Therapy Network Switzerland. The trainees will have the opportunity to develop skills in case conceptualising and treatment techniques over a period of three days of intensive training. The course comes as part of Sumud Palestine UK mental health project that aims to support mental health professionals in developing expertise in evidence-based and culturally sensitive psychotherapies. Supporting PABCT to become a source of local clinical knowledge for professionals on the ground is at the heart of Sumud Palestine UK. Sumud is committed to sponsoring courses delivered by international experts to a core group of Palestinian professionals who will subsequently take responsibility to disseminate their knowledge and skills by organising courses to others. PABCT was established in June 2015 as a result of a successful collaboration between Sumud Palestine, The Palestinian Counselling Centre (Jerusalem) and Guidance and Training Centre (Bethlehem). 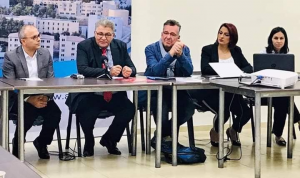 The association is led by a board who were elected at the association’s inaugural meeting and board members are volunteers who work actively to develop the association in the face of tremendous challenges related to the reality of Palestinians under the Israeli occupation.